Mountain Fiesta is a beautiful, rural, rustic venue set in Spring Creek for celebrations, weddings, retreats, workshops and private parties. We offer full service catering for weddings, private gatherings and monthly dinners. Glamping is offered in our casa, yurt and barn. 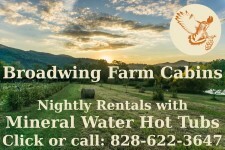 Beautifully remote, just down the road from Trust & Luck, NC, yet situated 45 minutes from all the wonders of downtown Asheville and 30 minutes from the lovely little historic town of Hot Springs, the AT and the brilliant Max Patch hike. Potentially a rich City Mouse, Country Mouse experience! Mountain Fiesta is our home and one of WNC's most unique venues. We want to live a full life in beautiful Madison County and blend our talents in the kitchen and the gardens to create a sanctuary for our guests. Camping is allowed with Barn, Casa & Yurt or Entire Property bookings.